In response to recent events, the Seattle Symphony is dedicating tonight’s performance of From Hanover Square North, at the End of a Tragic Day, the Voice of the People Again Arose by Charles Ives to the Orlando victims and their families. The work conveys the shattered, angry and confused emotions we experience during a tragedy. Conducted by Music Director Ludovic Morlot, the performance will be streamed live on Facebook so that everyone in our community can share the performance together. “Our entire country is suffering this week in the aftermath of the tragedy in Orlando,” said Morlot. “The musicians of the Seattle Symphony and I want to dedicate this performance not only to the victims and families, but to the idea that we are all part of a shared humanity. Yet again we have to use that quote from Leonard Bernstein one too many times: 'This will be our reply to violence: to make music more intensely, more beautifully, more devotedly than ever before.'" We will meet on that beautiful shore. Some workmen sitting on the side of the tracks began to whistle the tune, and others began to sing or hum the refrain. A workman with a shovel over his shoulder came on to the platform and joined in the chorus, and the next man, a Wall Street banker with white spats and a cane, joined in it, finally it seemed to me that everybody was singing this tune, and they didn't seem to be singing it in fun, but as a natural outlet for what their feelings had been going through all day long. The music is exceptionally emotionally challenging. Ives captures the broken, distraught and confused reaction we experience after receiving terrible news, the multitude of emotions that washes over us in a confused mass. As the movement builds, the chorus and brass eventually break out into the hymn, “In the Sweet By and By.” Once the hymn ends, the chorus disappears back into the shifting orchestral textures as the commuters head their separate ways, the moment over. 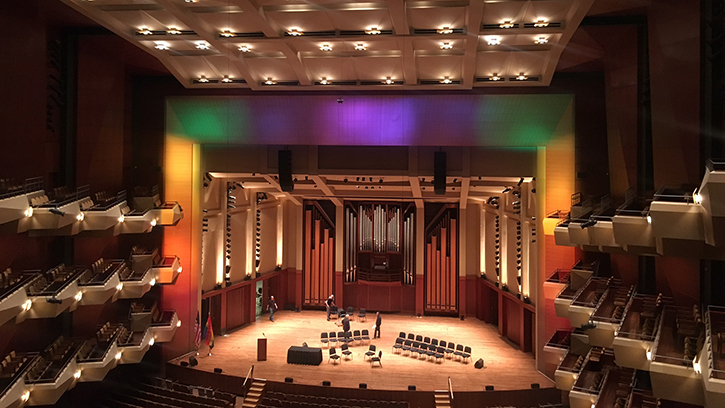 Tonight’s performance is part of the opening night of the Seattle Symphony’s summer festival, Tuning Up!, which celebrates the eclectic, surprising and uplifting story of American symphonic music over the last 100 years. Watch the Facebook Live broadcast on Friday, June 17 around 8:30pm (PDT) by visiting the Seattle Symphony’s Facebook page.